This is a lightweight portable battery pack stripped to its bare essentials. 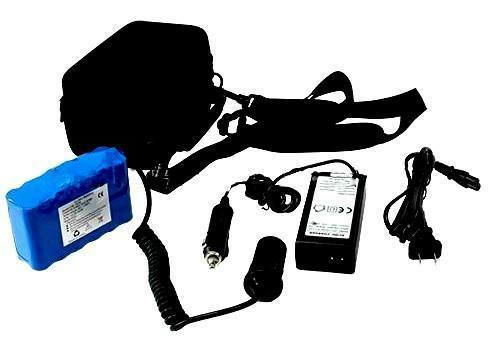 It is useful to make some CPAP machines portable, as well as supply a portable source of unregulated 12V for photographic lights or cameras. It weighs 650 grams, or 1.3 pounds and supplies 115 watt-hours, or 8.8 amp hours. It is equivalent to a 6 pound sealed lead acid battery. Included is the battery charger and carrying case. For those who need an off-the-shelf lithium ion battery pack for portability. It can charge a cell phone 15-30 times before recharging, which makes it perfect for camping trips. It can run a CPAP machine for 10-20 hours (without humidity control). As you can see, this is a battery consisting of 12 cells, shrink wrapped together with a battery management board. It does not have a plastic case to add weight. The output port is a cigarette lighter socket, and the charger plugs into the same port. Directly power devices designed to plug into a car power point or cigarette lighter, such as games, cell phone chargers, GPS, palmtop computers, flashlights or cellular "bag" phones, heated clothing, or 12 volt model car chargers. 7.8 Amp-Hour, 14.7 Volts nominal lithium ion battery will not leak or outgas and may be operated in any position. The Green LED lamp indicates that the battery is fully charged. You may leave the charger connected to the battery after charging without damage to the battery or charger. For added flexibility use our regulated DC/DC car power adapters for voltage outputs from 1.5 volts to 24 volts to enjoy unlimited use of electronic products such as games, portable DVD players, CD players, walkmans, MINI TVs, and heated clothing. Complete off-the-shelf battery pack/charger combination, including AC and Car chargers and 12 volt output.